Jerod Mayo suffered a "serious" knee injury and will miss the remainder of the season. Danny Trevathan fractured his left knee cap and will be out anywhere from 3-6 weeks. He can consequently be dropped in the majority of redraft leagues. Brandon Marshall will take his spot. Bengals linebacker Vontaze Burfict left Sunday's game for a handful of snaps with a "head" injury. Although he returned to the game, it's somewhat concerning news for a player who has already suffered two concussions this season. It's something to monitor and increases his overall risk, but owners have to continue rolling Burfict out in their lineups as long as he's starting. Armonty Bryant will be sent to season-ending IR after tearing his ACL 6 snaps into last week's game. This will hopefully provide 2nd year player Barkevious Mingo with more pass rushing opportunity. David Amerson suffered a concussion on Sunday and will have to clear concussion protocol before returning to the playing field. Bryon Maxwell is working his way through a calf strain that happened in Week 6. He will be re-evaluated as the week wears on. Mychal Kendricks, Chad Greenway, Lance Briggs, Jon Bostic, Ryan Shazier, Manti Te'o, Dashon Goldson, and Aaron Williams all missed last week's game due to injury. Just when owners thought they had a handle on the Atlanta linebacker situation, we get a curve ball. Based on what we had seen over the last couple weeks, Prince Shembo had taken the starting reigns from Joplo Bartu who had quickly become an IDP afterthought in our minds. However, last week Bartu played in 58 of the team's 78 snaps while Shembo only saw work on special teams. This could be a result of Shembo not being 100% healthy, but in any fashion, I'll be ignoring both players for the time being. Wesley Woodyard has been leaving the field in subpackages over the last couple weeks - a fact that has severely damaged whatever value he had left. Avery Williamson has been the only viable fantasy linebacker on the Titans, but he continues to rotate out every 3rd series which heavily negates his value as well. Williamson is worth a pick up in dynasty leagues, but it best avoided in redraft leagues at the moment. Tony Jefferson saw his snap count slashed down to 15. Conversely, Tyrann Mathieu saw a dramatic increase in his playing time with 50 snaps. It would be a prudent move to grab Mathieu at this point. Although Koa Misi led the team in tackles, he continues to be a base only player. Jelani Jenkins played in 100% of the team's snaps. Misi has LB3- value, but Jenkins is still the fantasy player to own here. Rob Ninkovich finally woke up from his early season slumber with a monster fantasy day that included 3 sacks of his former college teammate Kyle Orton. On the other hand, Robert Quinn has yet to record a sack and we are 6 weeks into the season. Unbelievable. Patience can quickly morph into stupidity, but I'm sticking with Quinn unless there are other DL1/DL2 options available on the waiver wire. Ha Ha Clinton-Dix has strung together three fairly good games in a row, but I still find him untrustworthy from a fantasy perspective as he continues to split time at safety with Micah Hyde. With Jon Bostic, Lance Briggs, and Shea McClellin all inactive due to injury, the Bears set of starting linebackers was completely overhauled for their game against the Falcons. Kaseem Greene and Daryl Sharpton were the every down linebackers with Christian Jones playing in base packages. Greene led the team in tackles and may be a decent LB4+/LB3- option against Miami next week if Briggs misses another game. DL Ezekiel Ansah (DET) - Owners practiced patience with Ansah were rewarded with a 2.5 sack performance that also saw the rookie record 5 tackles and force a fumble. He's playing in over 50% of the team's snaps and is showing flashes of explosiveness at an increasing rate. Although his matchup this week against the Saints is quite poor, I only expect his production to ramp up as the season progresses. DE Jerry Hughes (BUF) - Hughes has suffered through a serious case of Jekyll and Hide syndrome over the last handful of months. 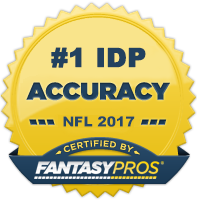 He looked untouchable during the preseason and flew up IDP draft boards as a result. But 4 weeks into the season, he had only 1 sack and looked lackluster on tape. With 12 tackles and 3 sacks in his last two contests, he seems to have righted the ship however. He has a juicy matchup against the Vikings this week who are allowing the 2nd most points to DEs so far this season. Very attractive DL3, solid DL2 option in Week 7. DE Jason Hatcher (WAS) - Despite a new system, Hatcher has picked up where he left off in Dallas. He's had 3 sacks this season, faces off against a team in the Titans who just gave up 9 tackles and 2 sacks to 3-4 DE Jurrell Casey, and gets the added bonus of a generous home stat crew. Sneaky low-end DL3 option this week. DE Brian Robison (MIN) - Robison was able to get off the schneid last week with 1/2 sacks against the porous Lions offensive line. He's made a living capitalizing against subpar right tackles which bodes well for him this week against a Bills RT in Seantrel Henderson who is one of the leagues worst. My gut tells me a multiple sack week is coming. WLB Brandon Marshall (DEN) - Marshall performed very well in replace of Danny Trevathan during the team's first three games posting stat lines of 8-2, 6-2-1, and 5-7. A fractured left knee cap will shelf Trevathan for another 3-6 weeks. That said, the Broncos will look to Marshall again as the starter on the weak side. He should be counted on for LB2+ numbers and be your priority pick up this week. ILB Jamie Collins (NE) - For those watching the New England/Buffalo game, it was apparent that Jerod Mayo suffered a severe injury to his leg. Although no specifics have been revealed concerning the exact nature of the injury, Adam Schefter is reporting Mayo will miss the rest of the season. This makes Collins a very attractive fantasy option. He will be on the field in an every down capacity and is a strong candidate to take over the weak side duties, a position he performed well in during last year's playoffs. He should be slotted near the bottom of the LB2 tier, but his upside ranges to the top of that tier. OLB Nigel Bradham (BUF) - The Buffalo linebacker situation has been an enigma for fantasy owners this season. Brandon Spikes was the fantasy target early in the year and then that focus shifted to Preston Brown. Now it looks like Bradham may be the most reliable option. Last week none of the linebackers played every down, but Bradham played the most and racked up 11 total tackles. There's obviously some risk here as the Bills like to play musical chairs with their linebackers' playing time, but he has two above average matchups before his bye week and is worth a spot as a mid-range LB4 in 12 team leagues. MLB Miles Burris (OAK) - Burris is not a good NFL linebacker. In fact, he's ranked dead last in Pro Football Focus' ILB rankings (by a wide margin). However, the Raiders defense has consistently received above average tackle opportunity. Given his role as MLB, he should be able rack up enough tackles on a compilation basis to warrant low end LB3- consideration. S Reshad Jones (MIA) - Just was on the list last week, but is here again in case for some reason you didn't pick him up. He played virtually all snaps and led the team in solo tackles with 9. He's locked and loaded as a DB1, top 5 play. S Usama Young (OAK) - Since taking over for Tyvon Branch two weeks ago, Young has posted 13 solos tackles. He won't do much outside of providing tackles, but should be a high floor/low ceiling DB3 option for owners looking for some consistency at the position. S Quintin Demps (NYG) - Demps was another player featured on this list last week, but he was mentioned more as a depth player in deeper formats. His 10 tackle performance against the Eagles has me re-evaluating his value, at least in the short term. He gets a Dallas team that is continually reaching the secondary on rushing attempts which should give Demps a ton of tackle opportunity. He has a high probability of 6-7 total tackles. CB Cortez Allen (PIT) - Allen has provided above average tackle numbers in every game this season outside of Week 2. He's 3rd amongst all cornerbacks in total tackles only behind the Texans' Jonathan Joseph and Panthers' Antoine Cason. He's likely taken in all CB-required leagues at this point, but has shown enough consistency to be rostered as a DB3+ in non CB-required leagues as well.